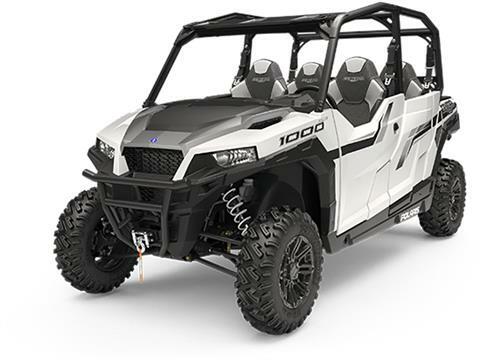 Spirit Lake Motorsports has a brand new 2019 Polaris 1000 General 4 EPS in Matte White Pearl for sale, MSRP is $21,799.00. With the new $700 REBATE for Polaris' Spring sales event savings, this General 4 is NOW Starting at $21,099.00. Call 970-627-9288 or e-mail us for a quote. The Polaris GENERAL 4 1000 delivers the performance and versatility you expect from the ultimate adventure machine, plus 4 seats to bring your friends and family along for the ride. Industry-leading power and acceleration, premium comfort, and all the storage you need. With the hard-working heart of a RANGER and the performance of a RZR, you'll have all the class-leading power and rugged features you need to share the thrill of off-road adventure. Class-Best 100 HP to light up the trail and broad, usable torque band to work--Pumping out 100 horsepower The Polaris GENERAL is the most powerful Rec Utility ever produced. The Polaris GENERAL has a class best 0-40 mph … 18% more horsepower than Commander so you can light up the trails. Class-Leading Suspension, ground clearance for the trail and to-do list. New! Fox Podium 2.0 QS3 Shocks, with 3 point adjustability. STANDARD FEATURES--The Polaris 1000 GENERAL 4 EPS Black Pearl comes standard with a Polaris HD 4500 lb. winch and front bumper to help you dominate the trail and take on the work when you get home. Please feel free to email or call for details. We have financing if needed. Let us help you get into the new machine. We are always here to help. We don't only sell machines. We ride them too! The parts dept. can help you trick out your new toy! Roof, Windshield, Plow…whatever you need. 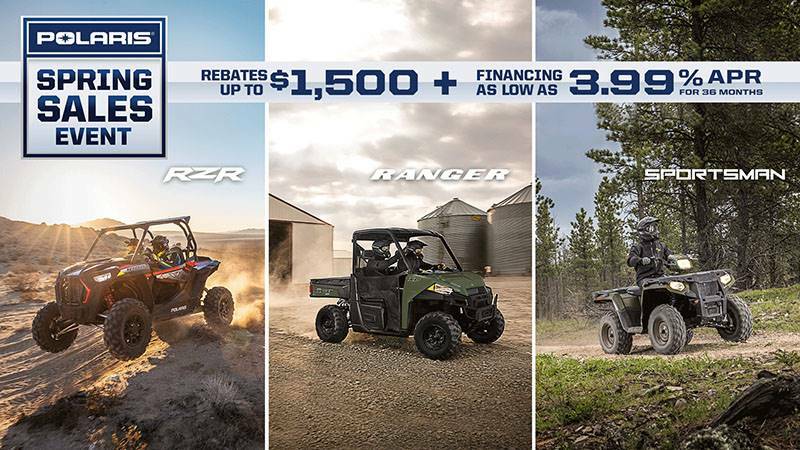 Polaris has some great financing offers, with qualifying credit. *Price valid for Cash or Standard Financing deal, with qualifying credit. Tax not included in above price. COLORADO REQUIRED DISCLAIMER: One Unit only. Rates and terms subject to change. Pricing valid through April 27, 2019. We will be closed from April 28-May 6th. Reopening on May 7th.